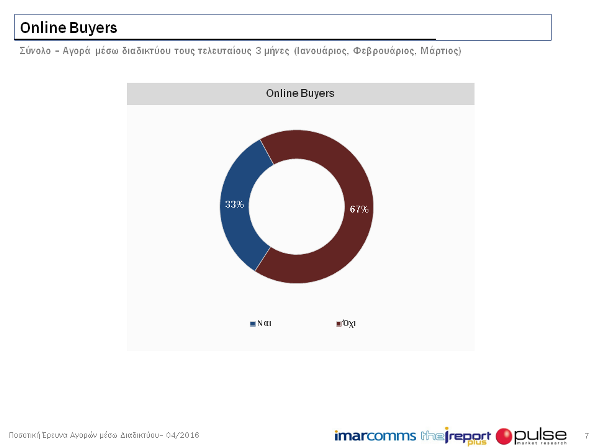 The results of the first quarter of 2016 of the subscription tool for measuring and analyzing online shopping in Cyprus - the I Report - were announced today by Interactive Marketing Services Company, ImarComms. The I Report is presented for the first time with a new structure, appearance and methodology as I Report Plus, adding more comprehensive reports emphasizing the demographic profile of each consumer group and the detailed internet behavior of each one. 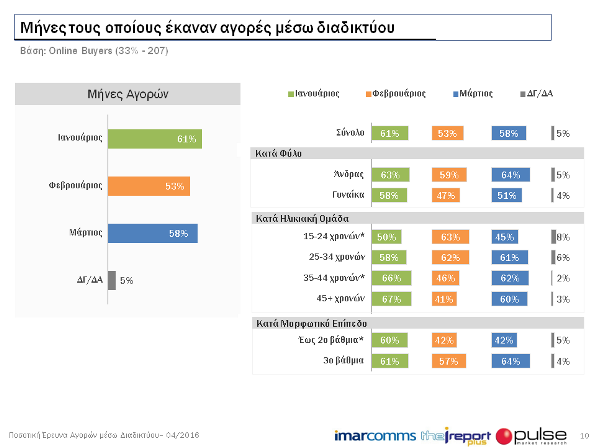 The I Report Plus tracked the online behavior of the Cypriot consumer for the first quarter of 2016 with January recording the highest buying traffic of the quarter with 61%, with March being second with 58% and February being third with 53%. The age groups that had the highest percentage of purchases per month were: the group 35-44 years for January, the groups 15-24 and 25-34 for February, and the group 35-44 years for March. Overall, the online purchases for the first quarter of 2016 were recorded at 33%. The I Report Plus recorded that most online purchases were made from a personal computer with 74%, followed by mobile phone with 28%, and Tablet with 15%. The age group that had the highest percentage of purchases via computer was the group 45+ years old, from the mobile phone the group 25-34 and via Tablet the group 35-44 years. The most purchases were made from home with 95%. Regarding the websites and online shops from where the purchases were made, the I Report Plus recorded as first Ebay with 47%, as second Amazon with 14% and as third Asos with 14%. Also from the other online shops, the I Report Plus recorded in the Top Ten among others - Ali Express with 6%, Aegean with 5% and Booking.com with 3%. 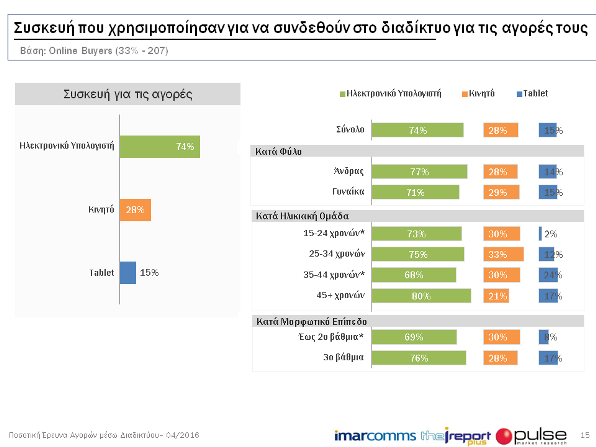 "The I Report Plus recorded the trend of online purchases for the first quarter of 2016 by analyzing the behavior of different age groups regarding their preferences on products and services while highlighting their new purchasing trends, with ages 25-44 being the most active", said Pericles Ellinas, CEO of ImarComms.